Instant information… How many times have you thought.. I wish I could see… this or I wish I knew that.. Managing your business today requires a level of thought unlike any other time in our history. Too many times owners get caught up in a lot of minutiae and details of information that is not just helpful. Or.. they only look at critical data 3 or 4 times a year and at that point it’s too late. The Rolling Stones said “tellin’ me more and more about some useless information…Supposed to fire my imagination.. I can’t get no satisfaction” Filtering through this information and getting it in front of your face is now far easier with the HireTrack NX dashboard. The dashboard allows you to create or “query” the database for information that is important to your business in easy to understand graphical form. 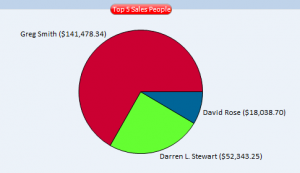 Say you want to keep track of how your sales team is doing? Maybe you want to compare your current sales year to last year. While the dashboard is a great way to access critical instant information, the power of the dashboard is really driven by the Query Book, which allows you to create your own queries. A query is basically a “question”. So, you have this mountain of data in your database, and you want “ask” the software to put specific information in front of your eyes. Now, you could create a printout, but most of the time people want to see the information on screen just so they can oversee the day to day operations and “keep their hand on the wheel”, so to speak. The query book uses an intuitive graphical interface to allow you to grab information from different databases, and present it on screen. Any software can collect data, but turning that information into something useful with which you can make a difficult business decision should be easy to perform. Querying or asking the database to give you information should be simple, and HireTrack NX’s new dashboard allows you to easily get the answers you need.